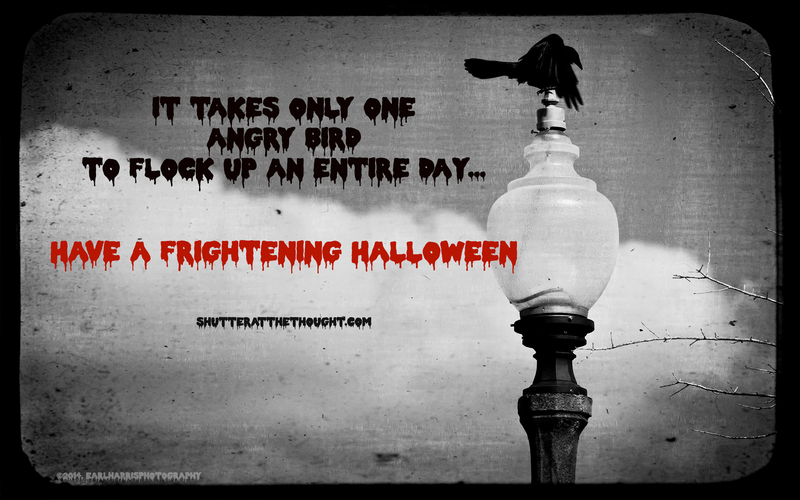 Halloween | I Shutter at the Thought! I’m sharing my final Halloween wallpaper for this year. This work of ugliness is a high-resolution desktop wallpaper measuring 2560×1600 pixels, designed to terrorize and scare away annoying coworkers. 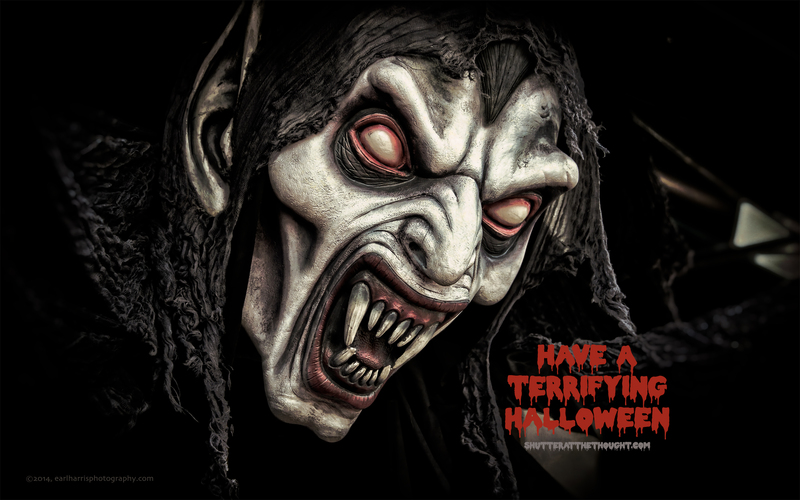 Enjoy it and have a terrifying Halloween! Reverse-click and Save Image to your local hard drive. Full-size image is 2560×1600. Halloween is just over a week away, so today’s photo is another Halloween-themed desktop wallpaper. This wallpaper may appeal to those who are fans of Alfred Hitchcock and particularly his film, “The Birds”. The first time I watched the movie was with my parents when I was pretty young. At one point in the film, I was instructed to close my eyes or leave the room. Watching it again a few years later, I learned my parents had attempted to shield my young eyes from viewing a citizen of Bodega Bay being robbed of hers by angry birds. I will spare my younger sister any embarrassment that may be associated with revealing her particular issues with this classic film. “The Birds” was the first horror movie I remember ever watching. What was yours? Last night, I went out to Old Town in hopes of finding some people strolling about in costumes. As it turned out, the only person in costume I ran into was this guy, who had quite an impressive airbrushed attitude on his face. “Alex Airbrush” is the artist behind this face. He has a booth at the Main Gate Flea Market on Highway 192 in Kissimmee (5401 West Irlo Bronson Memorial Highway / www.AlexAirbrush.com). When searching for a quote to use with this post, I chose the one above simply because I realized face and body paints have probably rendered it incorrect and obsolete. In fact, I’m thinking that thanks to body paint, nudist colonies are probably among the most interesting places one could find oneself on Halloween! Perhaps next year I should look into a photographic excursion; it would certainly bring a whole new dimension to how I think about exposure settings.